Well, the big day kind of snuck-up on us. Angela had been getting over a hamstring injury pretty much all of October and we had gone on vacation earlier last month. Therefore, when the end of the month came out of no where, we almost felt surprised that an entire month had gone by without either of us running all that much. I had run my second twenty-miler before our Alaska vacation and really hadn’t run much since during my taper period. Poor Angela hadn’t run any distance since her fifteen-miler back in late September. We both went out and ran a six-miler the Sunday one week prior to the MCM and Angela determined that her leg felt good enough to run on, though. Having Dave in town the day before the race really helped distract us though, which was probably a good thing. We had reserved a room at the Sheraton very near the start of the race, a couple of blocks from the new Air Force Memorial. This would prove to be great the morning of the race, but disastrous afterwards. We parked at Pentagon City and took the Metro to the Armory to get our chips and bib numbers. There was actually a line out the door of the Armory and down the block, which was sort of alarming. People were streaming in from everywhere to get in before 7:00pm (some people had come straight from the airport via taxi, with luggage in tow) when the race expo shut down. We made it in and picked up our stuff and proceeded to wander around the expo for a little while. We bought a couple of those throw-away Tyvek jackets since it would be cool and very windy the next morning. We loaded up on free energy snacks and other swag1. Clif was doing some pace-groups and handed out pace bands, which proved to be pretty handy. I enjoy using my Garmin GPS (a lot), but having the mile splits written out helps on over-all pacing a great deal and reduces the amount I have to keep checking my watch2 We finally decided we’d filled up our tote bags (mine actually started ripping), so we headed back out to the Metro to go find some dinner. We had broken out our D.C. travel guide books in hopes of finding some great Italian restaurant for our pre-race calorie-fest. However, there didn’t seem to be any that really stood out to us, although D.C. has some of the greatest places to eat and I’m sure the ones we read about are fantastic. However, being tired and really just wanting to get checked into the hotel, we opted to just eat at California Pizza Kitchen. We enjoyed our relatively soul-less, chain restaurant food well enough before driving past the Pentagon to our hotel. I would recommend the Sheraton National for anyone traveling to D.C. since it is very nice and the bed was insanely comfortable (we decided we wanted that very bed for our home), except for one thing: it’s no where near any Metro stops! The nearest is the Pentagon, and that is still nearly a mile away. We regretted that most of our time in the hotel was spent looking at the backs of eyelids, since it was pretty nice. We didn’t get to partake in breakfast, either, since that’s a bad idea before running a marathon. The following morning we got dressed and prepped for the race, and then headed out into the cold to walk to the starting line. It was a very chilly hike downhill around the cemetery and past the Pentagon to the bag check, at the Pentagon’s north parking lot. We met up with about 32,000+ other runners there and headed into the masses to find our spots in the queue. Angela got in near the 6:00 pace group and I kissed her goodbye after we wished one another a good race. I found my way into the 4:30 pace group and waited. Even though we had gotten there just as the first of two waves was to start, there was an administrative delay which had pushed that back 15 minutes or so. I should have taken advantage of the time I had to stretch my legs out some, but didn’t and I regretted that later on. Before too long, Vermont Sen. Patrick Leahy made an short statement just prior to the beginning of the race. He mentioned the MCM Forward in Iraq [.pdf], where 600+ men and women of the armed forces there would be running a marathon along with us (obviously not at the exact same time, since it would be the middle of the night there). That kind of got both my mind and my heart racing, and it was clear I wasn’t the only one. It was exciting to know that those men and women would be doing something ‘fun’ and ‘normal’ along side us in spirit. Sometime later, the second wave finally got moving forward and before I knew it, I was running in my second ever marathon. A plot I made using the data from my Garmin Forerunner 201 and USAPhotoMaps. The first part of the course, through Rosslyn, was somewhat dull although at one point a incredibly large American flag was hanging between two large buildings. It was just the first of many, many reminders of where we running this race: in the nation’s capitol. The crowd was so thick, it became difficult to get anywhere near my goal pace of 10:18 per mile. However, after three miles or so, running downhill to the George Washington parkway, I heard shouts from behind me: pace group, coming through! I realized this was the 4:30 pace group behind me (I had started off just behind them) and was determined to try and stick with them. I let them blaze a trail through on the way into Georgetown, where the path widened some and I was able to pick up pace to where I wanted to be. Over the course of the next few miles, we ran fast. So fast, in fact, I went from about two minutes behind pace to over four minutes ahead of pace. At some point, I lost the pace group, but figured I could just stick to about a ten minute mile and keep my four minutes in my back pocket until later. 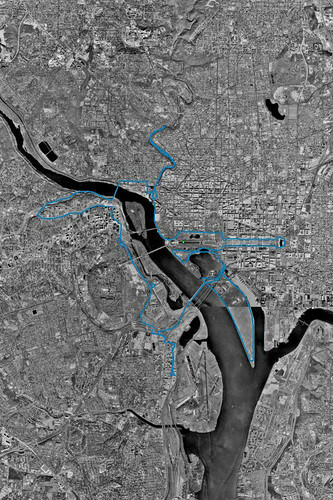 Around mile ten, the course comes into the mall area, near the end of the Arlington Memorial Bridge. If there is a ‘proper’ way for one to enter D.C., I’d say that L’Enfant had to have intended this to be it. The mall was absolutely stunning. I just wanted to keep running up and down it over and over, to tell the truth. Usually, I enjoy looking around while running but I was in awe the whole time. Not only had it become a beautiful day, but here I was part of the center attraction in D.C. It was as if the mall was all ours to enjoy. I think I nearly strained my neck looking at all the buildings and monuments as I ran by. It wasn’t as though I hadn’t seen all of them before, but this was just something so much more special. Today, these all belonged to me in a whole new way. It reminded me why I enjoy running crazy things like marathons: it’s a huge ego trip to be in such an amazing city among the most incredible buildings and statues while all the people are cheering for you. I’ll never know what it feels like to win the World Series, an Oscar, or a Nobel Prize. However, when running through a city that has opened up for you, it feels just as good. Well, if all good things must come to an end, mine did somewhere around mile seventeen. I was away from the mall now, running along side of the Potomac (inside Potomac Park) heading towards Haines Point . I noticed I was slipping off my pace quite a lot all of a sudden and needed some extra energy. I had just done an energy gel, and it was going to have to be something else. I decided I’d stop to pull out my iPod Shuffle and give music a chance to pick me up. It seemed to the do the job quite well for the next three+ miles, until the battery died! I hadn’t charged the USB stick up enough to have it play very long at all (30 minutes or so). Much to my disappointment, this happened right around mile 21, when I really began to hit the wall. My upper calves, which had been twinging for the past few miles had now begun to cramp up. Nearing mile 22, sudden ‘charlie-horse‘ cramps forced me over to the bridge guard rail to stretch out my calf muscles. Unfortunately, it was about this point when I had slowed down so much that I had already eaten up my four minutes (part of which was spent messing with the iPod, though). I had little hope of regaining that time since the cramps in my calves weren’t going anywhere (there still there, actually, nearly a week later). Any hope I had of keeping my 4:30 was gone. I made it through Crystal City and around the Pentagon, but I was having to stop more and more often to stretch out my calves. The cramps were getting so bad near the end, near mile 26 actually, I could barely stand. My foot was being pull down by the intense spasms in my calf muscles, to the point that even walking was getting difficult. At the turn uphill to the Iwo Jima Memorial, right at mile 26, I nearly cried when I saw just how steep a climb that last little leg was going to be. I tried to keep my head up and just plod up the hill, maintaining what I was now calling a run. However, I simply couldn’t maintain even that pathetic shuffle and was reduced to walking the last 50 feet of the hill until it leveled out, right in front of the bleacher seats. It was humiliating, but I picked up pace for the last 200 yards to the finish. I came in at 4:42:05. I suppose after almost five hours of exertion, I was a little weary, but I thanked the Marine who placed a finisher’s medal over my head when he told me congratulations. I mumbled out that we all ought to be giving them medals and he just laughed a bit. The Marines certainly always had my respect, but the way they put on this event (yes, it is mostly staffed by Marines), cheering us on and congratulating us was fantastic. I hobbled forward with the crowd, gathering up some food and such on my way to get my checked bag. After finally making it through what seemed like a mile of crowd, I found a spot of curb to sit down on and eat. I changed to a dry shirt, as is my custom after a long run, only to notice I wasn’t really all that sweaty. Funny, didn’t I just run a marathon? Why am I not dripping with sweat? It had been so windy, it had kept me dry. However, I was covered in a thick layer of white powder; salt crystals, actually. It was almost as if I had been rolling in salt all morning. I sat and waited for Angela for a while, and eventually got up to move around. I made great use of the little aluminum foil blanket a Marine had thrown around my shoulders (which was done for everyone as they passed the finish line) while hobbling back to the bag check, and then on to the Netherlands Carillon near the memorial, our agreed upon meeting place. Unfortunately, I had just missed Angela and while heading back towards the bag check, I happened to catch up with her. She had finished about 20 minutes earlier and had been waiting on me. However, both of us were too tired and too glad to see one another to be really upset. Angela had run a heck of a race for the first 20 miles, in order to ‘beat the bridge.’3 Given the fact that this was 30% further than she had run at any time since last year’s Richmond marathon, that alone was quite a feat. She had promised herself she wouldn’t have to push herself so hard beyond that point, and once you’ve made that kind of bargain with yourself, you’d better damn well keep it if you plan on your legs carrying you for another 10k. She walked and ran on and off the remainder of the race and finished in 6:43:42. A respectable time for someone who wasn’t even sure she could run six miles the week before. Angela really put forth a heroic effort on her own part to just attempt this race and I was really proud that she toughed it out and finished. I know she is proud, too. We caught the Metro at Rosslyn down to Arlington Cemetery, hoping we could walk back to the hotel. However, traffic was now on the Jefferson Davis Highway and it was getting dark (and colder). We walked over to the entrance gate of the Cemetery to ask a security guard if there was anyway to cut through the cemetery. There isn’t, but the gentleman standing next to the security guard offered us a ride, saying it was on his way and he was about ready to leave. It turns out, this fellow is a trumpet player for the Army Band Ceremonial Band. Angela enjoyed not only the short drive back to the hotel courtesy of our new friend, but also getting to ask about playing music with one of the countries most prestigious bands. We had checked out that morning, but were still parked in the hotel garage. We ‘borrowed’ the lobby restrooms to change into some warmer street clothes before leaving. We agreed a nice dinner would be great, but didn’t really have the energy to find some place nice. This meant that we agreed to just stop in Fredricksburg and eat at Outback (yet another chain restaurant, but oh well, we didn’t go to D.C. for the food this trip). That night, neither of us slept a wink, even after loading up on ibuprofen and Tylenol. Some muscles are just that sore. My calf muscles are still killing me. However, Richmond is in one week and I’m thinking: what the hell? Note: Although I brought my camera, I didn’t take any photos the entire two day trip. Although Angela and I agreed it was some of the most amazing sites we’d ever seen, we didn’t have the ability to photograph it. We may post up a few race photos we’ve ordered, though. way to go team coleman! my brother has me almost convinced to start training for grandma’s marathon in duluth next summer…so keep writing more of these types of stories! Well, Richmond is in four days, so I hope I’ll have another good report this weekend!